OBU's praise ensemble, David's Creed, will lead worship at Grand Avenue Baptist Church in Fort Smith, Ark., on Sunday, Nov. 4, during the 5 p.m. evening service. The community is invited to attend. Grand Avenue Baptist Church is located at 3900 Grand Avenue, Fort Smith, AR 72904. David's Creed takes a contemporary approach to leading worship. The band mixes contemporary music with traditional hymns. The repertoire allows the group to minister in churches with different styles of musical preference. 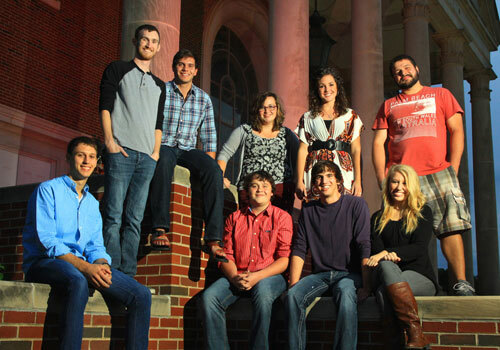 The auditioned praise ensemble was started by the OBU Division of Music in spring 2007. Its primary purpose is to connect OBU with the churches in Oklahoma and the surrounding region by serving those churches in worship through music, testimony and God's Word. For 2012-13, David's Creed includes OBU students Sammy Andrews, Karlie Clifford, Tabitha Gordon, Jason McPhail, Josh Michael, Taylor Miller, Nick Simmons, Sarah Stephens and Ethan Workman. The band, along with director Dr. Casey Gerber, travels during the academic year to lead worship in churches across Oklahoma. An assistant professor of music education, Gerber is coordinator of vocal music education at OBU. He teaches methods courses, supervises student teachers and conducts the Young Singers of Central Oklahoma in the OBU Preparatory Program. A native of Weatherford, Okla., Gerber earned bachelor's and master's degrees from Southwestern Oklahoma State University and his doctorate from the University of Mississippi. He has also completed level I training in the Orff-Schulwerk method of music education at Southwestern Oklahoma State University and level III training in the Kodály method of music education at the University of Oklahoma. He recently was awarded the Alexander Ringer Award for doctoral research by the Organization of American Kodály Educators (OAKE). For more information about David's Creed, contact the OBU Division of Music at (405) 878-2305. For more information about Grand Avenue Baptist Church, click here or call (479) 783-5161.